Walter Haskell Hinton began making paintings for reproduction in the 1920s, and probably continued to work for this market until the 1960s. Large printing houses published enormous quantities of prints that were sold in the form of calendars and frameable art. 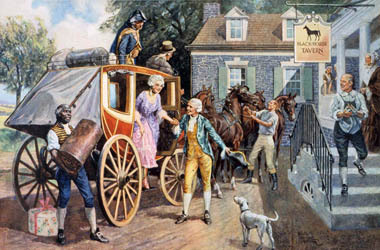 The calendars were usually used by businesses for promotion, while many prints were bought up by puzzle manufacturers. Because they were marketed to "everybody" as opposed to specific groups of people, the images draw upon familiar subjects known to sell well. NOS Litho. He had a particularly close relationship with Brown & Bigelow, with Hinton considering himself a sort of employee of theirs, although he always worked on a freelance basis for them. B&B introduced him to Washington National Insurance, who proceeded to use Hinton for 35 years. "Print culture" refers to the ways people use reproduced images, and how those images in turn influence people's perceptions of the world and the way they interact in it. Ever since the invention of the printing press, people have used printed images to brighten their homes, to express their personalities, and to send to others. 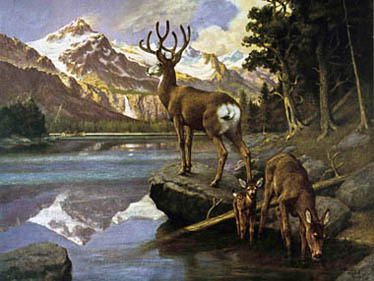 Walter Haskell Hinton understood the sorts of pictures that meant the most to average Americans: impressive and pleasant landscapes, events in well-known locales from pioneer days, perfect-looking family farms, and animals and native peoples indigenous to North America. These images are derived from the most commonly evoked and most treasured myths and symbols of the "real America," heard in presidential speeches, literary classics, and folk songs current in Hinton’s time and before. Collectively, the images speak not necessarily to strict reality, but to the aspirations of the nation since the Revolution. Although many have derided such pictures as "kitsch" – mass -reproduced images incorporating stock themes or icons calculated to trigger false sentiment – the power of the old, the familiar, and the dear cannot be dismissed lightly. That this imagery is so popular suggests it plays a very important role in national identity as well as individual pleasure. By enjoying these pictures, people participate in a community of like-minded individuals, finding comfort in belonging. 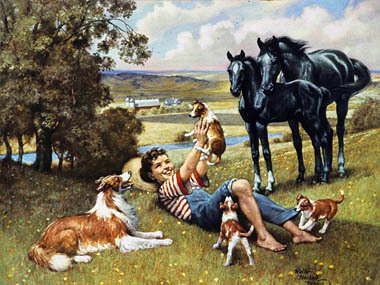 "Friend of the Family," from a 1960s series of episodes in the life of the farm boy and the baby animals of the farm. The landscape, with its idyllic farm, is similar to areas near Chicago, the artist's home town. Unlike calendars of today, old calendars typically featured only one image, and the months were to be torn off as each passed. 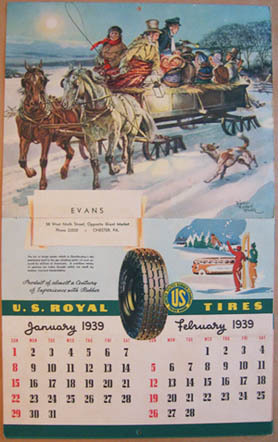 This calendar of 1939 used the new format, where every month had its own image.